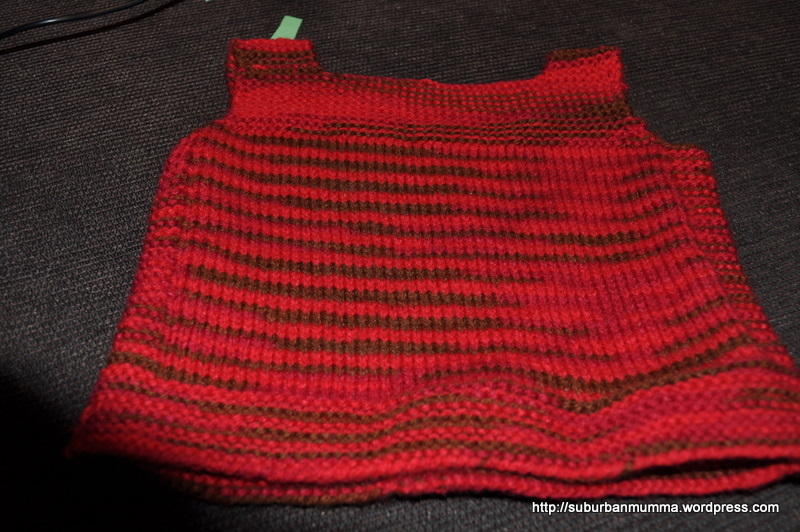 I finished knitting this vest(pattern here) last week for Babykins 🙂 I finished knitting a cardi for Babushka in the same yarn,2 months back. Gosh!I am turning into my mom..:) When we were growing up,my mom used to dress my sister and me,in matching dresses..sometimes made from the same fabric:) or if it was ready-made,same dress/pattern in different colors! And we used to hate it..I swore,I will never subject my kids to the same humiliation..but now that Babykins is coming along,I can’t help but feel,that they will look so cute in matching outfits..even if its a boy,the siblings can wear similar sweaters/jackets for a few years:D or at least they can be color co-ordinated!! Oh,we placed the order for a whole bunch of baby stuff..the baby crib,the stroller,car-seat,a glider for me to rock the baby to sleep. We can’t help but compare prices..Ofcourse,when we shopped for Babushka it was 4 years back and in another country..but still,Australia is SOO expensive!Oh! well no point complaining! Edited to add :the pattern link. LOL!! No point complaining as.. now that we are here in this country.. whats the point complaining..LOL! Wowww you made the booties!! can I see a picture please?Which one did you go with,finally? Niceeeeee:) I am glad you liked them..so,its the sarjee booties I am guessing..I want to make those too! And let me know how u go with this one! Ohh hush! you are a great mom!! !